Want to know how easy it is to lift your jowls in 2016? 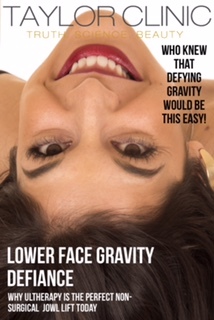 Ever wanted to defy gravity and lift those jowls from the ground? Well in 2016, we can. An Ultherapy ultrasonic face lift can give you a non surgical lower face lift for just $999. Ultherapy is a non -surgical procedure which stimulates the body’s own natural healing response to lift the chin, neck and face and smooth wrinkles. Ultherapy is TGA approved and uses ultrasound energy to help lift and tighten skin. Our answer. Because we can.